If you enjoy the sensation of an exercise bike but don’t quite like staying stationary — you’re in luck! Elliptical bikes are taking the world by storm. You can now enjoy the full experience of a gym based bicycle session while still taking to the streets for your daily workout. StreetStrider and ElliptiGo are two of the leading names in the elliptical bike industry at the moment. We took the time to break down the specifications of each so that you can make the best selection. When it comes to elliptical biking, StreetStrider and ElliptiGo are the front runners. The brands have been in competition for years to provide the best elliptical biking experience for consumers. ElliptiGo is the pioneer. The brand has been around since the beginning and its performance is consistently good. StreetStrider came a bit later and it’s equally as impressive in terms of quality and production. ElliptiGo is the brand that is sought after by professional bikers to offer something slightly different to their workouts. The bikes’ unique steering systems make them so desirable. StreetStrider units, however, are the elliptical bikes that are best for beginners. Anyone looking to try their hand at this sport would do well to start with one from this brand. Most elliptical biking groups encourage those joining to invest in one of these for their first experience on the roads. In order to select between these two high-performing brands, you’ll need to understand the specifications of each. Let’s take a closer look. In terms of design, the two devices are worlds apart. The ElliptiGo frame only features two wheels. There’s one in the front and one at the back. This requires you to self-balance while riding. This explains our earlier notion about the ElliptiGo being the sought after bike by professional riders — the two wheels create an experience similar to any other biking excursion. The StreetStrider is a three-wheeled bike. There are two wheels in the front and one in the rear. This means the bike balances itself and you’re free to ride without much concern about falling over. This too explains the earlier notion of the StreetStrider being the most ideal bike for beginners to start their elliptical journeys with. They can focus on their legs without worrying about keeping the units upright. Both bikes have aerodynamic frameworks that glide easily. The bodies are a combination of aluminum and plastic. The colors vary from model to model but usually come in some form of brightly colored palette. The steering on these two units is also different. 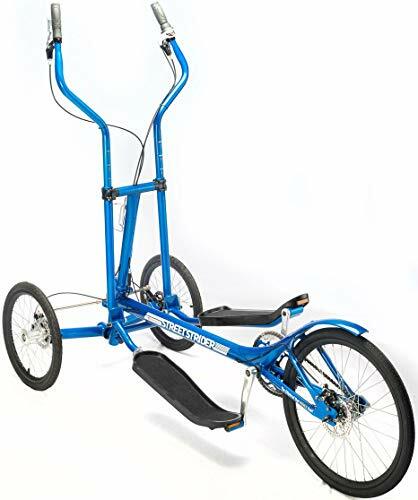 The StreetStrider requires you to pump your arms back and forth on the handles in order to power the bike forward. The ElliptiGo handlebars are fixed. They are simply there for the user to hold while riding and to maintain balance. The standing position on the ElliptiGo, however, is designed to help propel you up the hills when you pump your feet downward. This is similar to how the handlebars of the StreetStrider propel the bike when being pulled back and forth. Both bikes make use of the handlebars for steering purposes. The front two wheels on the StreetStrider steer the entire unit while the single wheel at the front of the ElliptiGo does the steering. When selecting your ElliptiGo model the speed ability will vary. You’ll have access to 3, 8 or 11 speeds. For riders who intend to encounter a lot of hills, the 8 or 11-speed unit is recommended. The unit will reach speeds of between 15 and 25mph. The StreetStrider offers a choice between a three-speed unit or an eight-speed unit. This bike will reach speeds of between 15 and 20mph. The ElliptiGo range is slightly more versatile and high-performing in terms of speed abilities. When it comes to comfort and stability the StreetStrider definitely comes in first place. The presence of that second wheel really makes the bike a secure way to navigate the roads. The only downside is that it’s notably bulkier. Both units feature handlebars that are well padded for optimized comfort while driving. This is particularly important for the StreetStrider that requires hand motion in order to move. Both the StreetStrider and ElliptiGo have the structural ability to handle weights of up to 250lb. Anything more than this and the units will be under too much pressure & may not perform well. Either of these units will be a worthwhile introduction into the ElliptiGo range. ElliptiGo as a brand tends to include most of the most notable features as standard across the range. They vary quite widely in ability and feature packages. Be sure to check through the unit you’re interested in to see that it embodies everything you expect from your elliptical bike. In terms of quality and performance, both brands are equally impressive. In our opinion, it really comes down to how experienced a rider you are and what features you expect from your bike. The StreetStrider is the perfect elliptical bike for an entry-level rider who is still finding his or her feet in this activity. In contrast, the ElliptiGo bike is best suited to experienced riders or people with naturally good balance. 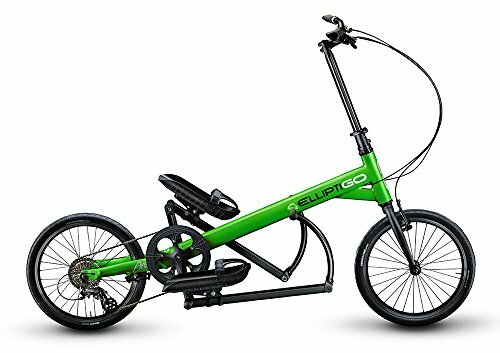 If bike riding has never been your thing in general, then entering the elliptical world with an ElliptiGo model may not be the best idea. You’ll feel overwhelmed and may never fall in love with it. In the end, both brands have a lot to offer any potential buyer. If you’re dedicated to mastering the sport then there’s no harm in going for the more difficult, high-performing ElliptiGo unit from the start.